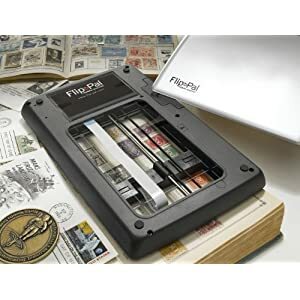 Thanks to Professor Dru (Drusilla Pair) of the Find Your Folks blog who created this video of Ol' Myrt here demonstrating the new Flip-Pal mobile scanner I got at the Atlanta Family History Expo. The scanner get's it name because you can remove the lid, then flip the scanner as shown above, when scanning things from old photo albums, diaries and such. Notice that the bottom has a clear opening, so you can see through the scanning mechanism to the document to be scanned. The scanner runs on AA batteries of any type including rechargables, though they do not recommend mixing battery types. There is a 1.7 inch screen showing what has been scanned. Everything is saved on an SD card, which is easily transferred to your computer via an SD slot. If your computer doesn't have an SD slot, the Flip-Pal ships with a small USB adapter, as I demonstrate in the video. The SD card that comes with your Flip-Pal has a "stitching" program that permits scanning segments of larger documents. The Flip-Pal website explains "The software is on the SD card, but the actual stitching is done on the computer. You can copy any of the Flip-Pal™ Toolbox software programs to your computer. That way you can use them without the SD card attached. The amount of computer space used is quite small by today’s standards." This scanner is one of of Ol' Myrt's all-time favorite techie things for genealogists and scrapbookers. This was a Christmas present from me to me. Can't wait to try it out. How well does the stitching program work? That greatly interests me. I've experimented with this twice -- once with large graphic spaces (easy to match up) and once with regular 10pt Times New Roman text. Both times, the stitching program did a virtually seamless job, Dae. So this sounds good.